A value chain analysis helps you recognize ways you can reduce cost, optimize effort, eliminate waste and increase profitability. A business begins by identifying each part of its production process, noting steps that can be eliminated and other possible improvements. In doing so, businesses can determine where the best value lies with customers, and expand or improve said value, resulting in either cost savings or enhanced production. At the end of the process, customers can enjoy high-quality products at lower costs. A value chain is the full range of activities – including design, production, marketing and distribution – businesses conduct to bring a product or service from conception to delivery. However for companies that produce goods, the value chain starts with the raw materials used to make their products, and consists of everything added before the product is sold to consumers. Value chain management is the process of organizing these activities in order to properly analyze them. The goal is to establish communication between the leaders of each stage. This helps to ensure the product is placed in the customers’ hands as seamlessly as possible. Outbound logistics is the distribution of the final product to consumers. Marketing and sales involves advertising, promotions, sales-force organization, distribution channels, pricing and managing the final product to ensure it is targeted to the appropriate consumer groups. Service refers to the activities needed to maintain the product’s performance after it has been produced, and includes things like installation, training, maintenance, repair, warranty and after-sale services. Firm infrastructure refers to an organization’s structure and its management, planning, accounting, finance, and quality-control mechanisms. Company-appointed coffee buyers select the finest quality coffee beans from producers in Latin America, Africa and Asia. The green or unroasted beans are procured directly from the farms and are transported to the storage sites, after which the beans are roasted and packaged. They are then sent to distribution centers, a few of which are company owned and some of which are operated by other logistic companies. The company does not outsource its procurement, ensuring high quality standards right from the point of selection of coffee beans. Starbucks operates in 65 countries, either in the form of direct company-owned stores or licensees. Starbucks has more than 21,000 stores internationally, including Starbucks Coffee, Teavana, Seattle’s Best Coffee and Evolution Fresh retail locations. According to its annual report, the company generated 79% of its total net revenue during fiscal year 2017 from its company operated stores while the licensed stores accounted for 10.5%. Intermediaries have little or no presence in product selling. The majority of the products are sold in their own stores or in the licensed stores only. As a new venture, the company has launched a range of single-origin coffees, which will be sold through some leading retailers in the U.S.; these are Guatemala Laguna de Ayarza, Rwanda Rift Valley and Timor Mount Ramelau. Starbucks invests more in superior quality products and high level of customer service than in aggressive marketing. However, need-based marketing activities are carried out by the company during new products launches in the form of sampling in areas around the stores. This includes departments like management, finance, legal, etc., which are required to keep the company’s stores operational. Starbucks’ well-designed and pleasing stores are complemented with good customer service provided. They have dedicated team of employees in green aprons. The committed workforce is considered a key attribute in the company’s success and growth over the years. Starbucks employees are motivated through generous benefits and incentives. The company is known for taking care of its workforce, a key reason for a low turnover of employees, which indicates great human resource management. There are many training programs conducted for employees in a setting of a work culture which keeps its staff motivated and efficient. Starbucks is very well-known for use of technology, not only for coffee-related processes (to ensure consistency in taste and quality along with cost savings) but to connect to its customers. Many customers use Starbucks stores as makeshift office or meeting place because of the free and unlimited WiFi. Back in 2008, the company launched a platform where customers could ask questions, give suggestions and openly express opinions and share experiences; the company has implemented some of the suggestions, including for its rewards program, from this forum. Starbucks also uses Apple’s iBeacon system. Customers can order a drink through the Starbucks phone app and get a notification of its readiness when they walk in the store. The concept of value chain helps to understand and segregate the useful (which help in gaining a competitive edge) and wasteful activities (which hamper market lead) accompanying each step during the product development process. Moreover, it also explains that if value is added during each step, the overall value of the product gets enhanced thus helping in achieving greater profit margins. After identifying the primary and support activities, businesses should identify the cost drivers for each activity. For a more labor-intensive activity, cost drivers could include how fast work is completed, work hours, wage rates, etc. Businesses should identify links between activities, if costs are reduced in one area, then it can be reduced in another. Businesses can then identify opportunities to reduce costs. Identifying the activities that create the most value to customers is the priority. These can include using relative marketing strategies, knowing about products and systems, answering phones faster, and meeting customer expectations. The next step is evaluating these strategies in order to improve the value. Focusing on customer service, increasing options to customize products or services, offering incentives, and adding product features are some of the ways to improve activity value. Lastly, businesses should identify differentiation that can be maintained and adds the most value. 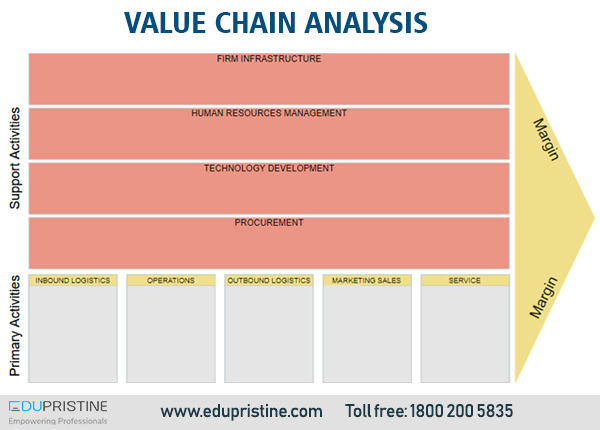 Ideally, value chain analysis will help identify areas that can be optimized for maximum efficiency and profitability. However, it’s important, along with the mechanics keep customers feeling confident and secure enough to remain loyal to the business. Thus by analyzing and evaluating product quality and effectiveness of services, along with cost, a business can find and implement strategies to improve. Next How I Switched my Career from Engineering to Digital Marketing?